I’m not a morning person. Most Saturday and Sunday mornings, you’ll find me drinking coffee and reading the papers. 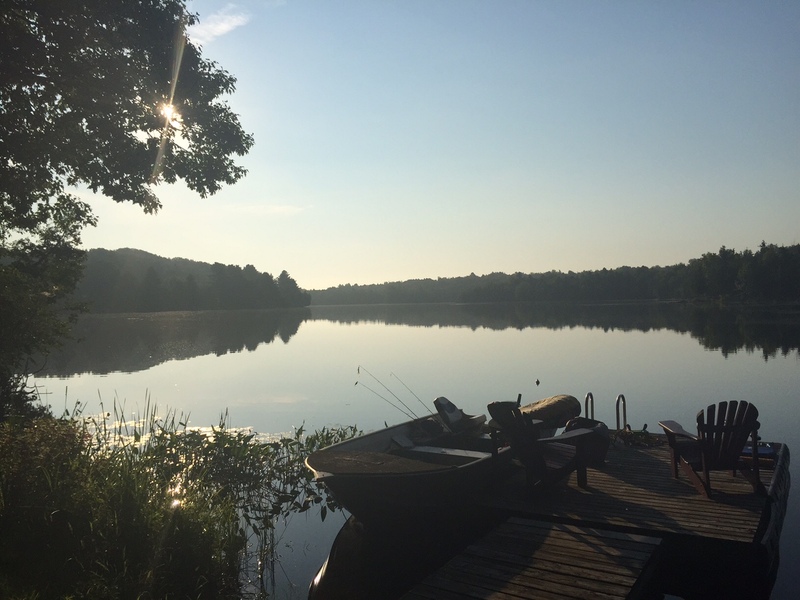 But in the summer, when the sun is sparkling on the lake, I’ll get up early, fill a thermos with coffee and head down to the water to watch the lake come to life. I wiped the morning dew from the deck chairs and drank my Cooke’s coffee. A lone painted turtle poked his head above the water. 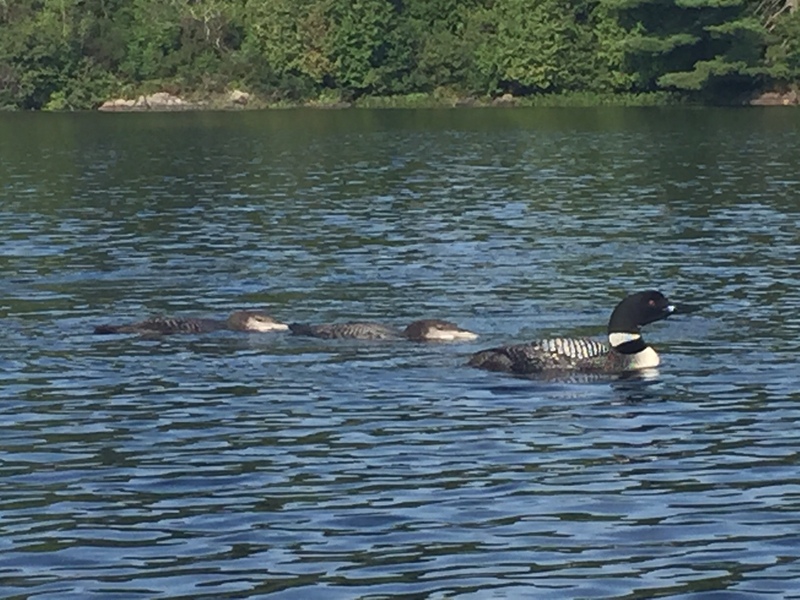 Across the lake, the loons were in the midst of early morning take-off practice. Did I mention that our loons had twins this year? We’ve named this year’s offspring Leo and Lana and they’ve grown big and strong. Today was the day their parents decided to start flight training. Loons are lousy flyers. I have no idea how they make it to the Gulf of Mexico each winter. They skim across the lake, their wings laboriously slapping the water. Just when you think they’re never going to make it, like a 300 lb man being dragged behind a boat on waterskis, they eventually rise out of the water and you hear the flap, flap, flap of their wings as they circle overhead. The other night, Dave and I were out fishing, and we watched as one of our loons botched a landing. He was careening in from the air, trying to level out as he got close to the water, tipping his wings right, then left and hit the water so hard it’s a wonder he didn’t lose a leg. Another time, I swear I almost got hit by one. We were in the canoe and off in the distance ahead, a loon was starting to take off. He must have misjudged the distance between him and our canoe, because he kept coming closer and closer until he lifted off just metres before our boat. He was so close I literally ducked. I wanted to go see our loon family, so I rolled over the kayak and pushed off from shore. I always check my kayak before I start paddling in case there are any bugs, frogs or other creatures in it. 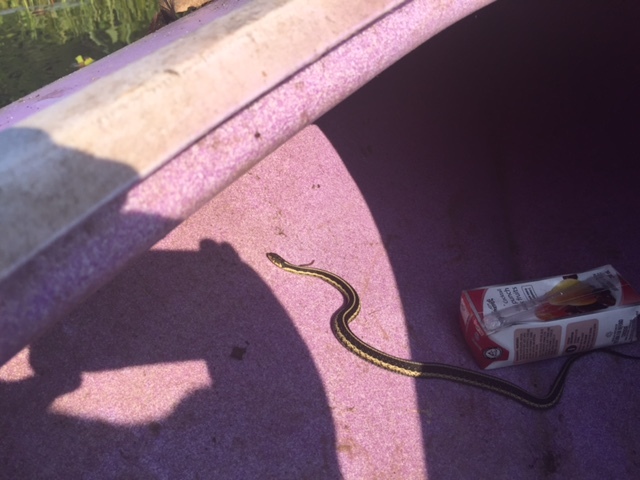 Half way across the lake I realized I had a stowaway– a little garter snake who was slithering up beside my seat. He was a well behaved passenger and just curled up in front of my kayak for the rest of the trip. I saw a green heron, a family of five turtles on the rock down from our dock while I was swimming and lots of fish. It was a good morning–well worth rising early for. This week’s #HappyAct is to rise and shine and see what adventures await. There’s only a few weeks of summer left. Make the most of every sun-kissed minute. Living in the city is a bit different, but, early mornings are still great. They are quiet. We back onto a busy road…but, on a Sunday morning there is almost no traffic at all. It’s definitely a great time to be out and about. When I lived in Ottawa, I used to love going to the parkway on Sundays–it was closed down to road traffic and was just for bikes–a great way to spend the day! We could do a rise n shine morning at the cottage maybe. It’s the getting-out-of-bed part that is the hardest. Once I am up then I agree with you that it is a beautiful time of day. I’m in if you’re in, but I think it all depends on how the night goes!